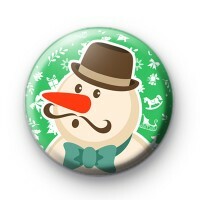 This is a listing for a festive themed 1inch pin button badge. Its green with a cute snowman wearing a hat. Its the perfect Christmas badge and ideal for adding to craft projects or as a handmade stocking filler .